Lee Davy talks to Daniel Negreanu about his Platinum Pass Adventure, the importance of living a life of abundance, service and refusing to get into low-frequency disputes. I walk into the area where the best in the world are competing in the €100,000 buy-in Super High Roller. I extend a hand to Patrik Antonius’ Social Media Manager ( I made the title up). I love his jacket. I can never remember his name. I find it difficult to decipher what he says. But I love the guy. He reminds me of David Bowie. Not that I ever met the man, but you get my point. A man who has spent his life refusing to conform. There is a status thing in poker. It’s rarely spoken of, as to do so, opens you up to criticism. I don’t always feel like I belong. I am not a poker player; I am the guy who interviews the poker players. The relationship feels based on a class hierarchy. I can’t shift it. People may say I am making it up, and that it comes from my sense of insecurity- something from my childhood, perhaps? But I feel it. In standing up and asking if I am ready, Daniel makes me feel like I belong, and that my role in this room has importance. I don’t know if he consciously does this because he also sees this divide, or he subconsciously behaves in this way, because his parents created him to be a beautiful person at his core. Either way, I appreciate it. It tells me that other people’s needs are critical to him. And so it’s no surprise that Daniel chose the ‘service’ angle when creating his Platinum Pass Adventure (PPA), asking his tribe WHO they would play for if he gave them a $30,000 Platinum Pass? I wonder where these ‘service’ cells come from? 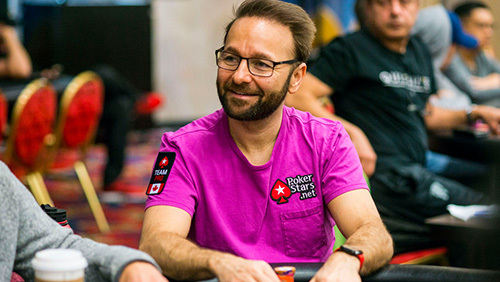 “I was raised by two parents who were every generous spirits even if it was as simple as someone coming over, and making sure they were well fed and had drinks,” Negreanu tells me as I fire my first question his way. “My mother would make sure you had food; my father would top up your glass. “Then as I got older, I did an emotional intelligence course called Choice Centre, and through that, part of the biggest thing we learn through the leadership portion is giving. And since then it’s always been a staple for me. You may have noticed there was a considerable leap in time between honed for a life of service by his parents and taking the emotional intelligence course. I’m curious. Is life-experience an essential ingredient when it comes to serving others? 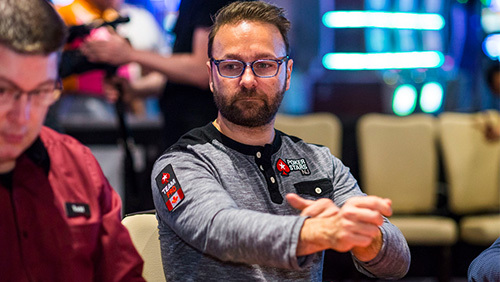 “I have always lived from a place of abundance,” says Negreanu. “When I had $200, and someone asked for $40 I gave it to them. I was always too generous. I lived as though I was a millionaire when I had $300 in my pocket. Most people live from a place of scarcity. I never did. When you live from that place of abundance, it feels like the universe works with you, not against you. While living from a place of abundance, and operating at a high-level frequency may be an unfamiliar place for me, I see it a lot in the players that compete in the high rollers. Not everyone, but most. It seems as if you are to draw up the blueprint for the perfect poker player, this feeling of abundance, gratitude and service seems an essential piece of coding. Sticking with the theme of service, I ask Negreanu if he had unlimited funds at his disposal, what area of scientific research would he invest in so he could make a difference in the world? “I would spend a lot of time and energy on the environment and what we could do to protect water sources and also dive into the idea of finding different protein sources,” says Negreanu. “We need other ways of feeding the world that doesn’t require so many animals killed every year, which doesn’t seem sustainable according to what science says. Barcelona is a beautiful place, but like more and more countries that I visit, the high number of homeless people stuns me. I’m not alone. Negreanu recently asked his 450,000 Twitter followers what they would do to reduce the number of homeless in the world, and so I pose him the same question. One of the things I love about interviewing Negreanu is he rarely dodges a question. His openness is a plus for folks like me. But this refusal to wear a mask leads to complications that must cause ripples in his high level frequency. I ask him if he had the chance to remove the anger from one person in the world and replace it with inner peace who would he choose and why? It’s an incredibly positive answer. How can this man always be so positive? “Nobody is positive all of the time,” laughs Negreanu, “but I am self-aware and check in with myself when I in a mood or a way of being that I know doesn’t work. I have always been a self-driven and highly motivated guy irrespective of whatever situation I am in. I try to look at the responsible version of how I created my experience, and how am I going to respond to it. I ask him if he could remove one thing from his conscience what would it be and why. As soon as the question falls out of my mouth, I realise the futility of it. I wonder what true personal freedom means to a man who plays games for a living, and has earned enough money to buy most of the materialistic nonsense some people crave. “I have been reading a very interesting book about what our natural state is as a human being,” Negreanu responds. “Before agriculture we were gatherers. During that period there was pure happiness, so it’s not money that causes that. It’s a sense of community and feeling like you’re not being controlled. And during that time women were on equal footing as men. There was no separation. They shared everything. There was no ownership until agriculture became a thing. What’s the grossest thing you have ever put in your mouth? Negreanu is also a mind reader. I move on to something else. If Negreanu could remove the vocal chords from someone for a year who would it be and why? It’s not a question Negreanu wants to answer. I sense something has happened that’s prompted Negreanu to close up concerning the question of naming people who have pissed him off. In the past, I would ask for a name, and he would have given one. Not today. I wonder if the criticism he receives on social media has begun to bother him at a different level? “When you’re in the public eye you’re going to get a lot of people commentating on you,” says Negreanu. “What I have learned over the years is if someone wants to drag you into the mud, they can stay there. If you’re trying to tear someone down, you’re admitting they are superior to you. I don’t like to give too much attention to stuff like that because I don’t think it’s worthwhile. “It comes with age and wisdom,” says Negreanu. “I look back at a lot of ways I have handled poker issues in the past – very vociferous and in your face. I was young and had a way of doing things. I have learned in the industry if I want to work with the people in the WPT, WSOP or whoever there is a certain way of handling that. You don’t automatically go into attack people. You first reach out to those people. You talk to them behind the scenes and figure things out. Maybe Negreanu should have created a MasterClass in Life-Coaching and not poker? And off he limps, leaving me searching for the high frequency, abundancy switch like a blind man looking for a cane on a bouncy castle. The post EPT Barcelona: Daniel Negreanu on abundance, service and frequency appeared first on CalvinAyre.com.